After extensive discussions with our Authorized Dealer network, Reliable Controls has moved forward with initiatives to strengthen our software authorization process by employing a software key. 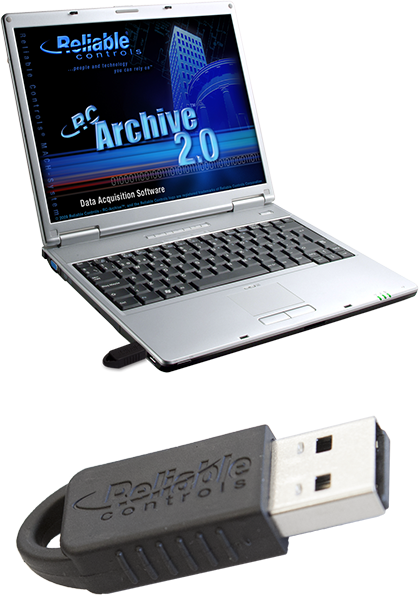 RC-Archive® 2.0 Update 1.10 is the first software offering from Reliable Controls to require the use of a software key (USB-Key) for authorization. The Reliable Controls USB-Key offers several key advantages. Firstly, the USB-Key will not automatically de-authorized if something changes on the PC (e.g., bios setting, hard drive upgrade, etc). Secondly, it is easy to move the license on the USB-Key between machines. If the client buys a new machine, simply download the latest software from the web, and insert the USB-Key, and the installation will be automatically authorized. Another advantage of the USB-Key is that administrators can expand the number of archives permitted by purchasing additional licenses and adding them to an existing USB-Key. The new RC-License Manager™ software that ships with RC-Archive® 2.0 Update 1.10 allows this to be done easily. Yet another advantage of a USB-Key is that administrators can borrow the license from the USB-Key and hold it in a machine for up to 7 days. This is very handy if end-users or administrators wish to operate a machine temporarily without a USB-Key, or to temporary authorize a machine for a balancing contractor or commissioning agent. And lastly, in the future, administrators will be able to add licenses for RC-Studio®) or RC-Toolkit®, or any other Reliable Controls software, when those software products are updated for use with a USB-Key.